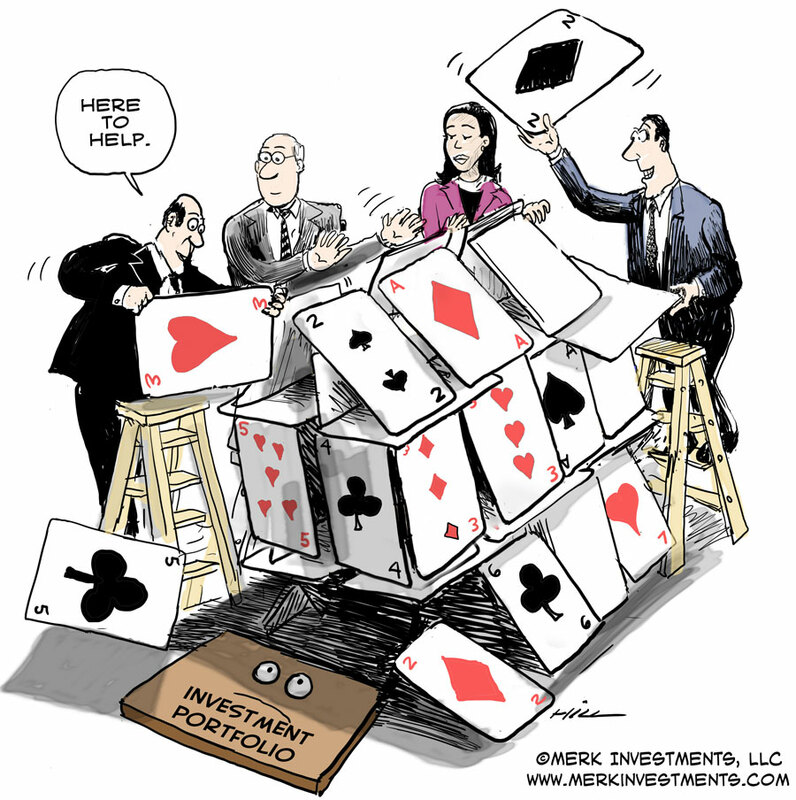 Merk Insights - Is Your Portfolio a House of Cards? Is Your Portfolio a House of Cards? The S&P 500 continues to hit new all time highs, but is your portfolio built on a house of cards? The politics to kick the proverbial can down the road may unleash dynamics that could be hazardous to your wealth. The one thing politicians throughout the world have in common is that they rarely ever blame themselves. They tend to diffuse responsibility or place blame on groups such as political opponents, the wealthy, or foreigners. If you now add that we have very real and major challenges in the world, it may be reasonable to assume that policy makers will continue to remain engaged in “fixing” things by blaming others. As an investor, if nothing else, this means asset prices may continue to move away from fundamentals and reflect the next perceived intervention by policy makers. This presents challenges for investors trying to maintain the real purchasing power of their portfolio and avoid a major drawdown at the wrong time. Going forward we may continue to see less political stability as weakness in the real economy breeds discontent. In the U.S., they vote for more populist politicians, helping to explain the rise of the Tea Party and the Occupy Wall Street movement. In the Middle East, where rising food and energy prices comprise a much bigger portion of disposable income, people revolt as they can’t feed themselves anymore. In Japan, Abenomics is introduced by a populist prime minister. Meanwhile both monetary and fiscal policy create a more challenging landscape for real economic prosperity to emerge. Instead of a rebirth following the global financial crisis we get a phony house of cards that may come down on the heads of investors who think that policy makers have their best interests in mind. One of the most relevant dynamics for investors to be aware of is that the interests of a government in debt are not aligned with the interests of investors. A government in debt has an incentive to debase the value of its debt, whereas investors have an interest in earning a positive real return on their savings. The investment tools we have been focusing on to tackle these challenges at the core are currencies and gold. Gold may do well as the value of debt (and with it the dollar) is debased; gold also has historically had a low correlation to other asset classes, thus serving as a candidate diversifier going forward. Currencies can also serve as valuable tools: with currencies, one can design a portfolio that has a low correlation to other asset classes; currencies are historically less volatile than gold. On the other hand, other countries also face challenges, so some thought has to be put into a currency driven strategy. We can’t know for certain that either currencies or gold will protect investors against a collapse of the proverbial house of cards, but we are afraid that ignoring these dynamics could be perilous. I will expand on this discussion and provide more feedback from my takeaway of what the Fed Presidents and others said at the above conference in our upcoming webinar on Wednesday, June 24 at 4:14 ET please register. If you haven't already, please make sure you have signed up for our newsletter so you never miss a Merk Insight again. Also, if you find these analyses valuable, spread the word on social media by posting a link to this article. Follow me on Twitter to receive real-time an alysis of market-moving events.